Do your knees shake just thinking about going to the dentist? You’re not alone. The American Dental Association says dental anxiety is more common than you may think. And, it’s not just kids. Adults, too, fear the dentist. 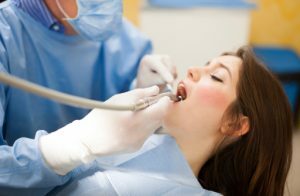 So, Dr. Joseph G. McCartin, dentist in Chicago, compassionately helps scared patients with sedation dentistry options to relax worried minds so teeth and gums get necessary care. From Your Dentist in Chicago: Come On In To See Us! Dr. Joseph McCartin, your premiere dentist in Chicago, would like to invite you to come on in and see us! We’ve been providing patients with high quality dental care and personalized attention for over 30 years. Whether it’s time for your next cleaning and check up, or you’re looking to enhance the appearance of your smile, we’ve got you covered. Our goal is to meet all of your needs under one roof at our practice, so you’ll never have to go elsewhere for care. Here are a few of the exceptional services you can expect to find when you work with Dr. McCartin. Comments Off on From Your Dentist in Chicago: Come On In To See Us!